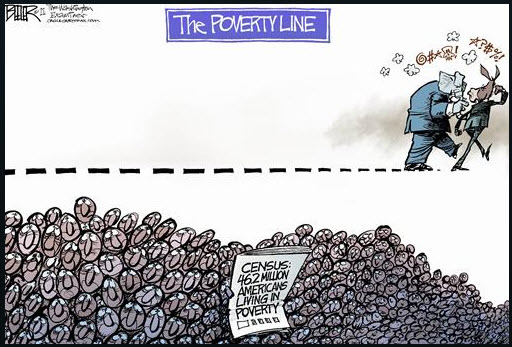 If there is any doubt that the middle class in this country is disappearing the new statistic of 46.2 million below the poverty line verifies that fact. It now takes more than two or three jobs at minimum wage to get out of this group. With our spending forty times more for our military than any other country and our healthcare costing more than twice as much everyone else we will probably be here for quite a few years. Or at least till the politicians come to their senses, if that is even possible, about these two huge anchors around our necks.